Snow is in the forecast! Read below for information about free parking in Evanston garages, anticipated parking restrictions, shoveling guidelines, and more. Sherman Plaza, 821 Davis St. Maple Avenue, 1800 Maple Ave.
Church Street, 525 Church St. Drivers will need to present the ticket they received upon entering the garage in order to exit for free. 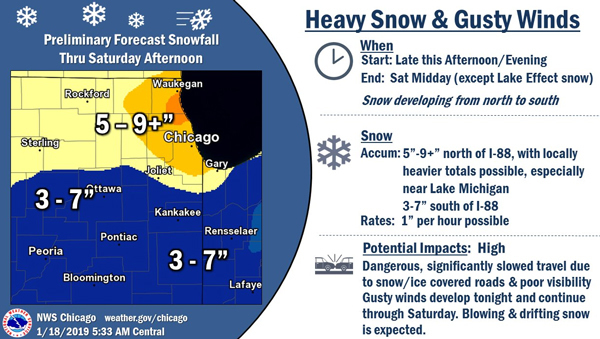 Four to eight inches or more of snow is forecast for Evanston. 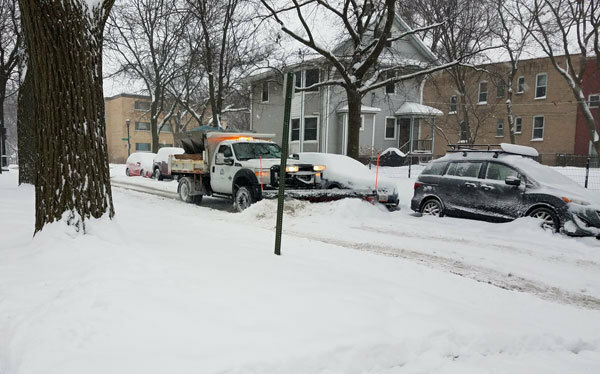 You can help Evanston Public Works crews facilitate safe travel by avoiding parking on main streets posted as Snow Routes this evening and overnight. Voluntary compliance is requested. A Snow Route Parking Ban affecting main streets posted as Snow Routes is anticipated for Saturday, January 19 at 11 p.m. until Sunday, January 20 at 6 a.m., and Sunday, January 20 at 11 p.m. until Monday, January 21 at 6 a.m. A Snow Route Parking Ban can be declared after two inches or more of snow. Snow Emergency even/odd parking restrictions are anticipated for Sunday, January 20 and Monday, January 21, between 8 a.m. and 6 p.m. In the event of a declared Snow Emergency, no parking is allowed on the even-numbered side of the streets on even dates (e.g. January 20) and no parking is allowed on the odd-numbered side of the street on odd dates (e.g. January 21). Snow Emergency even/odd parking restrictions affect side streets with parking on both sides that are not posted as Snow Routes, and can be declared after four inches or more of snow. The City will announce declared parking restrictions following accumulated snowfall. 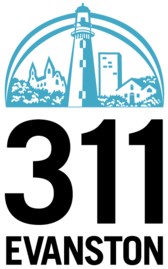 Visit the City's Snow Parking webpage to review parking rules and ways to stay notified. Public Services Bureau Chief Edgar Cano provided an update on expected snow in Evanston this weekend. Friday and Friday night: Snow develops this afternoon with flurries entering our area after 3 p.m. Snow intensity should pick up this evening around 9 p.m. with potential snowfall rates between 1/2 to 3/4 inch per hour. Crews will be battling high winds of 35 miles per hour, which will cause major snow drifts in some areas. Accumulated snow by 2 a.m. is expected to be two to three inches. Saturday: Storm intensity is expected to continue into late Saturday morning with an additional two to three inches by 11 a.m. Snow will then diminish, bringing only a trace until 3 p.m. However, strong winds will still be blowing, which may cover some roads back over. Saturday night and Sunday: Lake effect snow may enter our area as early as 7 p.m. on Saturday and may continue until 8 a.m. on Sunday. This could potentially bring an additional one to two inches or more depending on wind direction. 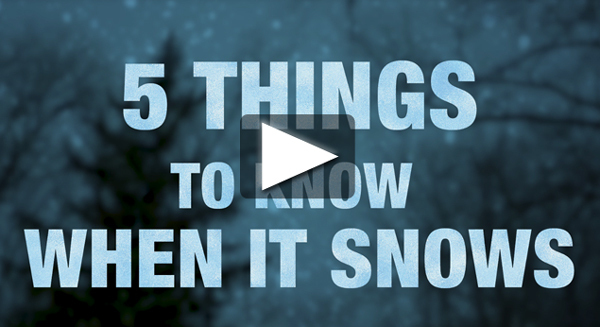 Possible snow accumulation totals: Four to eight inches or more. Public Works Agency staff is on alert and monitoring all forecasts. Crews will be in for the duration of the storm and for cleanup that may extend into Monday. Need help shoveling snow or want to help your neighbors? 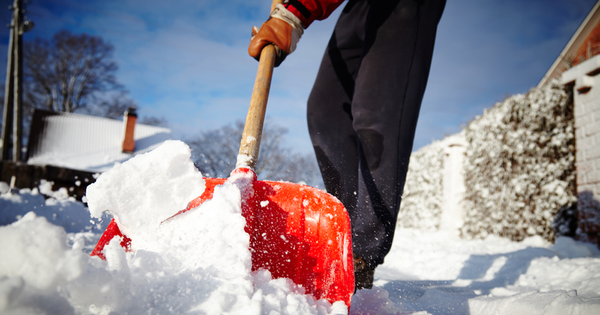 The City's Senior & Disabled Persons Snow Shoveling program connects residents with volunteers who are willing to provide snow shoveling services. Click the button below to sign up or call/text 847-448-4311. Property owners are responsible for clearing a path at least 36 inches wide whenever there's an accumulation of four inches of snow or more. If you own a multi-family property, common entrances and sidewalks must remain free of ice and snow following any snow event. Business owners are required to shovel walkways and are encouraged to use salt, sand, or ice melt to keep sidewalks clear for visitors and customers. The City does not clear snow from sidewalks in business districts. Thank you for your cooperation in keeping Evanston sidewalks safe and accessible. Evanston 311 will be open on Saturday and Sunday from 7 a.m. to 3 p.m., and on Monday from 7 a.m. to 6 p.m. Questions? Call or text 847-448-4311, or dial 3-1-1 in Evanston. 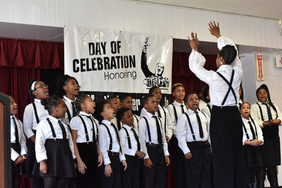 The City's Dr. Martin Luther King, Jr. Day of Celebration and the Gibbs-Morrison Reboot event planned for Sat., Jan. 19 will proceed as scheduled. 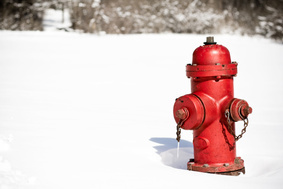 Assist Evanston first responders by clearing snow from around fire hydrants. Keeping fire hydrants visible and accessible from the street can save precious time in an emergency.